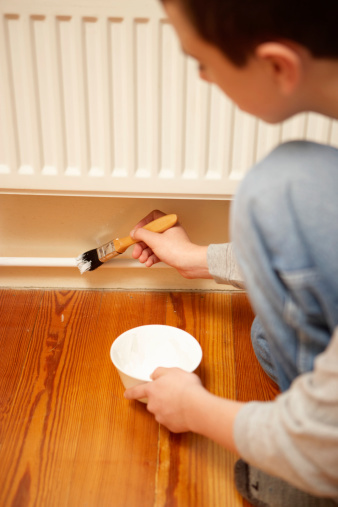 Positioning a radiator underneath a window counteracts drafts in the winter, warming cool air before it enters your home. But covering the radiator with curtains traps heat, minimizing the efficiency of the unit. Create balance while avoiding these issues by installing a double return rod outfitted with floor-length curtains to frame the window and a shorter panel to cover the window. This creates a classic floor-length look without covering the radiator, and the return rod seals the edges around the window, improving heat efficiency. Choose interior curtains that graze the sill when dressing deep-set windows. Find the center of the window and measure up from this point 4 to 6 inches or the desired height of the return rod. Mark this point with a pencil. Measure down from this point to the desired stopping point of the interior panels to determine their length. Prevent damage to the hem of the curtain by maintaining at least 1 inch of space between the bottom hem and the top of the radiator. Go higher, up to 2 inches between the bottom hem and the radiator, to add definition. The former option is ideal when there's a large gap between the top of the radiator and the bottom of the window, while the latter works beautifully with taller radiators. Position the measuring tape at the left corner of the window frame and measure up the same distance as you did at the center of the window. Mark this point with a pencil and repeat this on the right side of the window. Set the measuring tape on the left mark and extend out to the left of this point 6 to 10 inches. Mark the wall and repeat this on the right side, extending out to the right the same distance. This notes the two primary brackets for the rod. An extra-wide rod allows the long panels to frame the window without excessive bunching, making it easier to keep delicate curtain fabric away from the radiator. You can go wider than this if desired. Erase all of the pencil marks between these two points. If the entire arrangement is over 48 inches wide, leave the center mark in place to note the position of the center support bracket. Draw a level line between the left and right marks to indicate the entire length of the double return rod. Calculate the length of the line. Multiply this by 2 or 2 1/2 to find the total width of the interior panels. Measure from the left end of the line to the left edge of the window. Multiply this by 1 1/2 to find the total width of the panels for one side of the window. You'll need a second panel or set of panels the same total width for the opposite side. Because the longer panels will stay open, they don't need to be as wide as the interior panels. Hold the left bracket against the wall on the mark to the left of the window. Line up the rod support with the line. Mark the screw holes and repeat this process on the right side of the window. If necessary, hold the center support bracket against the center mark above the window and mark the screw holes. Drill pilot holes, tap in wall anchors if your holes don't go through a header or stud, and secure the brackets to the walls with the provided screws. Slide the panels onto their respective rods and attach the rods to the brackets. For most double return rods, you need to secure the interior rod first. Pull the outer drapes open so they rest on either side of the radiator without covering it. Amanda Bell spent six years working as an interior designer and project coordinator before becoming a professional writer in 2010. She has published thousands of articles for various websites and clients, specializing in home renovation, DIY projects, gardening and travel. Bell studied English composition and literature at the University of Boston and the University of Maryland.